You are browsing the Blog for In the Nest Box. Had a nice opportunity to watch the female in the nest box this morning. 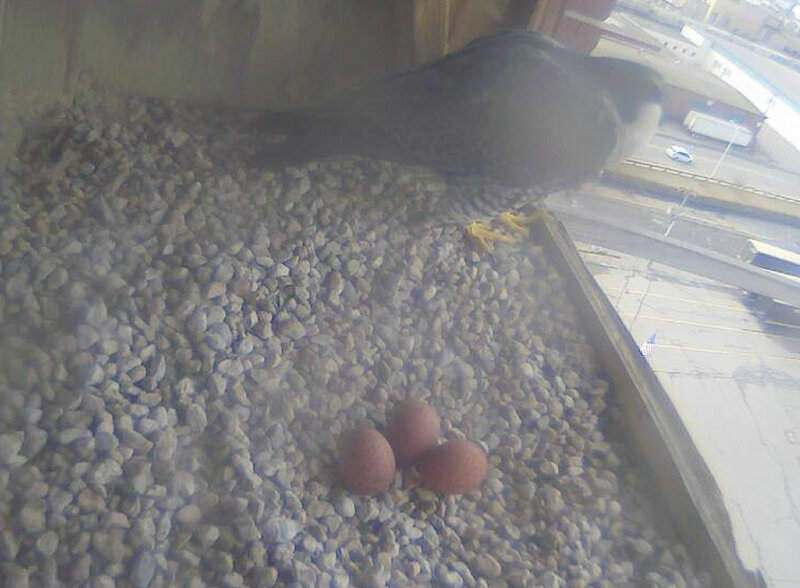 Just before 7AM, she raised herself up a bit and changed positions but remained over the 4 eggs. 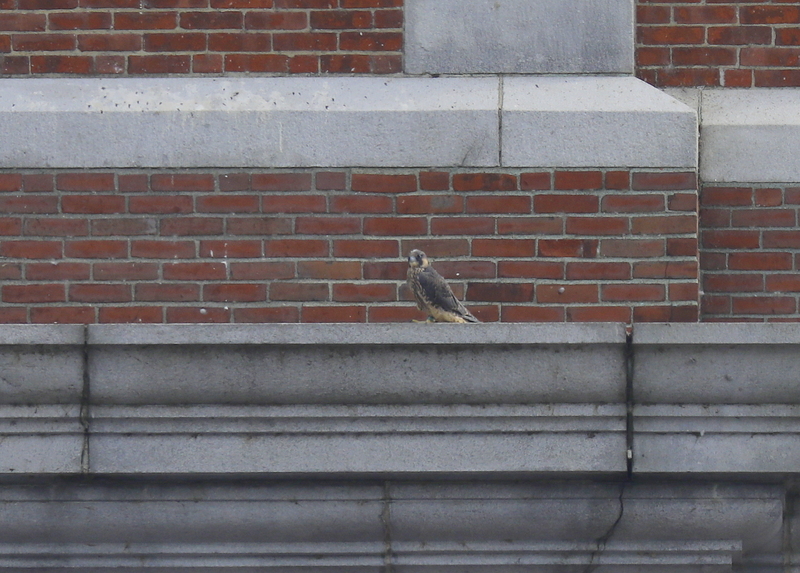 Then at 7:07AM, she departed for a few minutes and returned to the box, and then back to incubating the eggs. 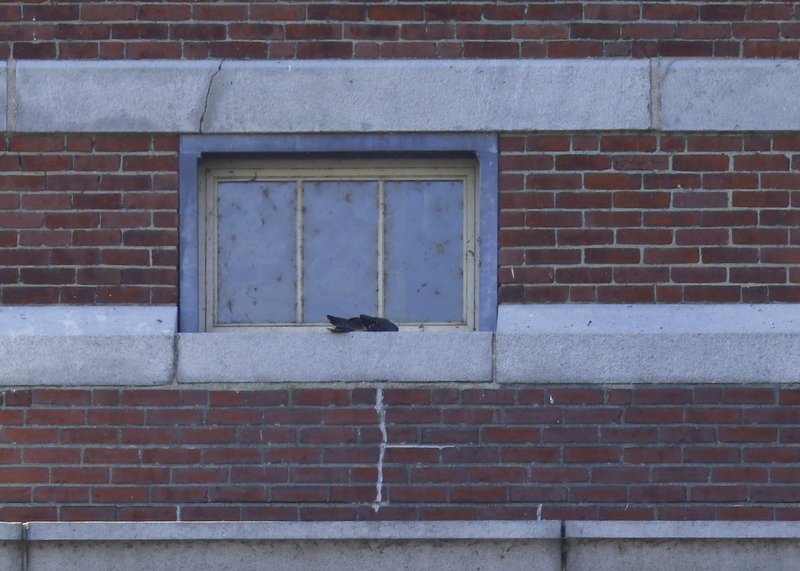 During incubation, an observer may spend lots of time watching very little activity. 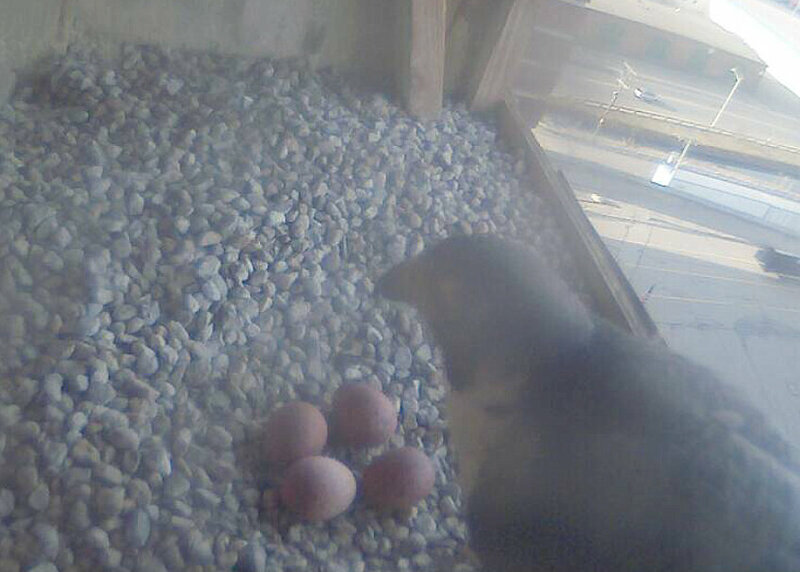 The peregrines take turns brooding the eggs. Typically, the female incubates about 2/3 of the time, often for four or more hours before the male relieves her. Males brood for shorter periods– typically 2 to 3 hours, and they brood less frequently. 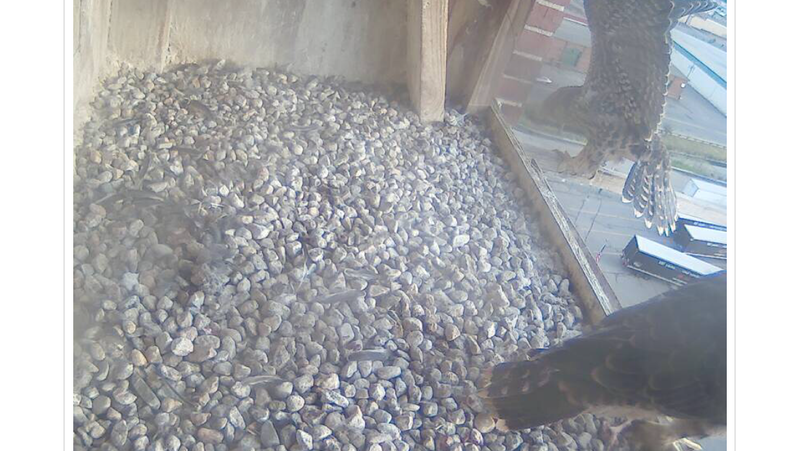 While one adult is brooding, the other may be out hunting. 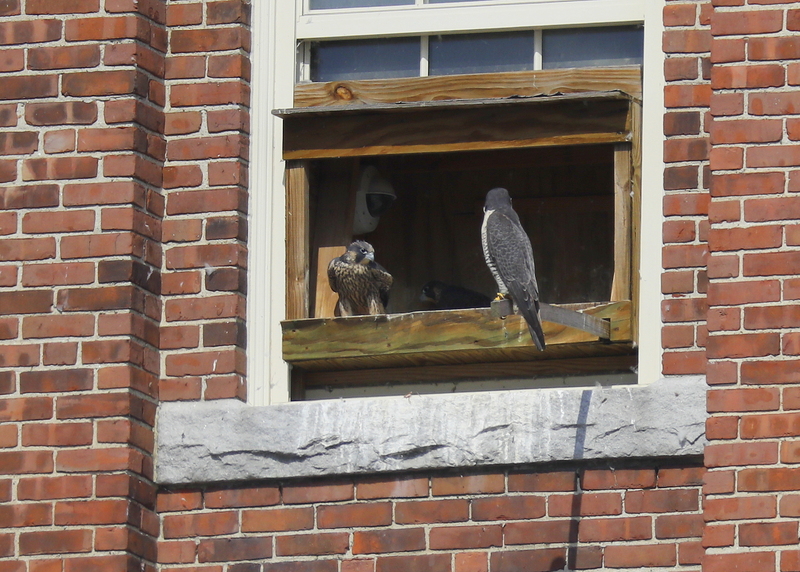 Brooding falcons still need to eat, after all. If they’re not hunting, the other falcon usually stays close to the nest. The photo on the left shows the female sitting on eggs quietly and with great comfort. She will adjust as she needs to but is not fidgety as the male tends to be! Sometimes while the female is brooding the eggs, the male will bring her food that he has hunted. 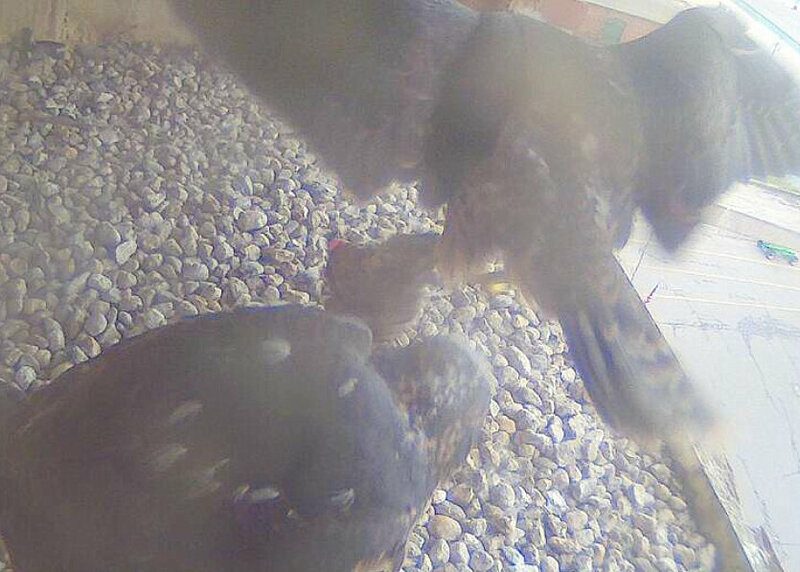 She’ll eat the food, sometimes inside, and other times, outside the nest box while he takes a turn incubating, but then she’ll come back and take over– provided she can get him to move off the eggs. If he doesn’t move right away, she may stand in the nest box and wail at him. Wailing has different meanings for falcons, but in general it indicates dissatisfaction with the current situation. 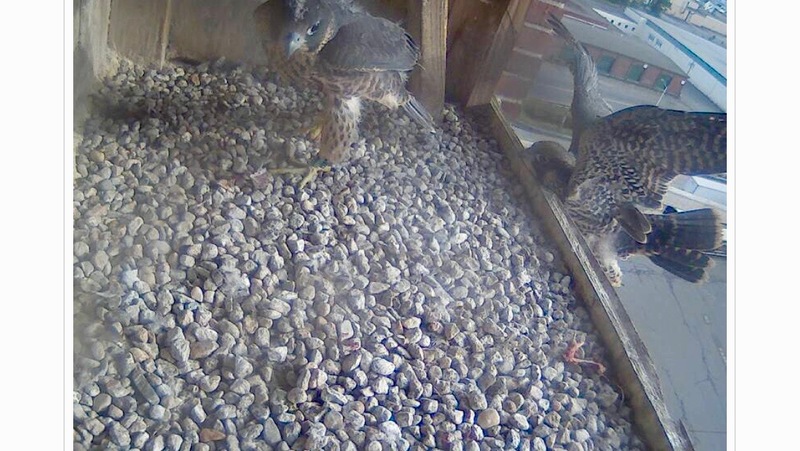 Here they are together, inside the nest box at around 10:35 AM today, and she is wailing on him big time. 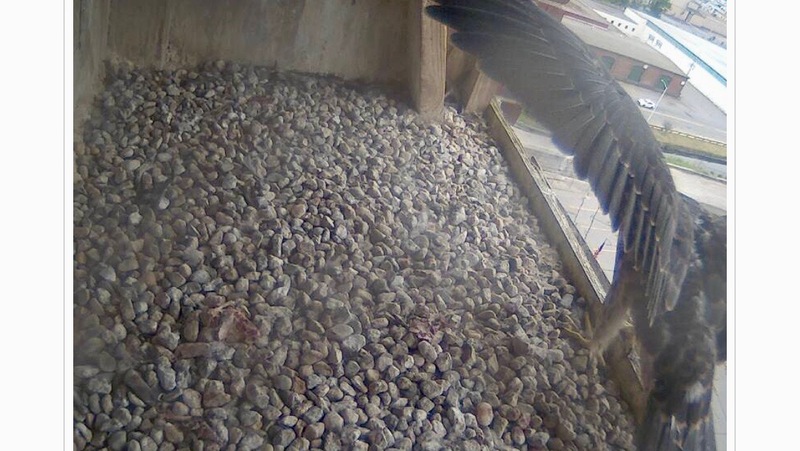 So if this female wails at her guy while he’s incubating, or in the nest box it’s her way of telling him she’s not happy that he’s still standing around, or sitting on the eggs. As with most other interactions between male and female peregrines, the female usually gets her way, though sometimes it takes a while for him to get the message! Guess who’s usually walking away, with his head bowed low, after getting wailed at….the male! 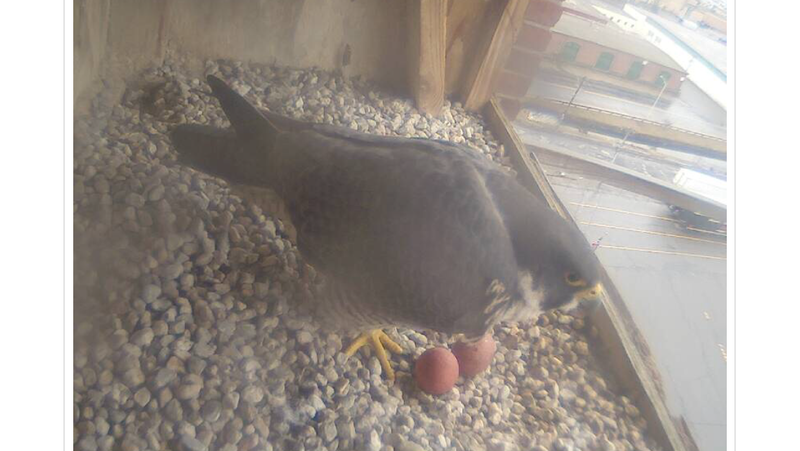 Always nice to report yet another egg has been laid this afternoon for the 2019 Lawrence Peregrine family! 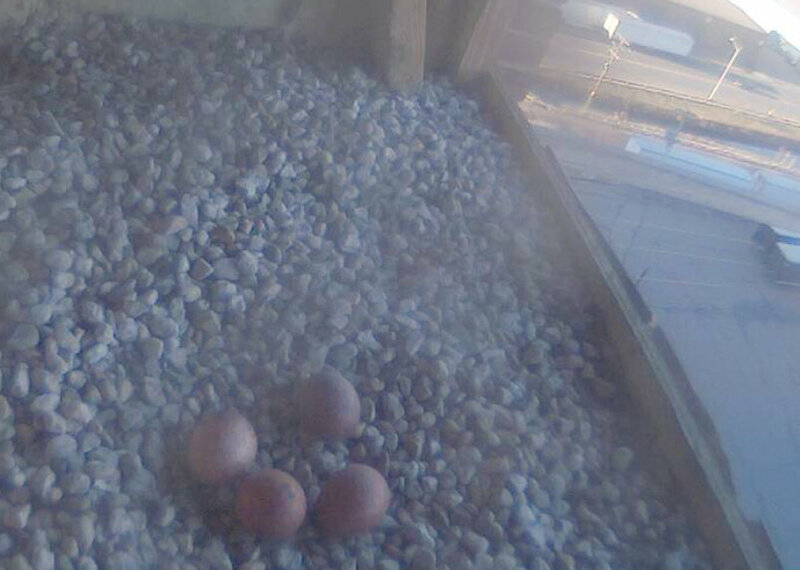 In most years for this location, the eggs have consistently been laid roughly 48 hours apart. Last year, the final egg arrived 72 hours after the third egg……no big deal. 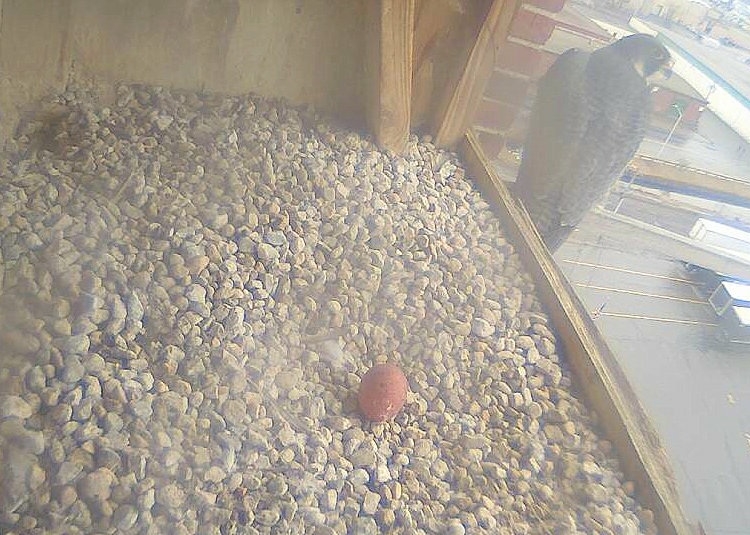 We have seen far more incubation going on this year prior to the third egg being laid. Today we had clear skies, afternoon temps just into the low 50’s, and winds from the SW at 15MPH, with gusts up to 25MPH. Let’s look for final egg on Thursday afternoon! Any questions or comments, feel free to check-in at cbgibson AT comcast.net! The morning started off under mostly cloudy skies, wind from the south at 12MPH and gusts up to 23MPH, and temp at a balmy 57F. The forecast calls for showers, mainly after 1pm. High near 63. South wind 11 to 16 mph, with gusts as high as 31 mph. Chance of precipitation is 80%. New precipitation amounts between a tenth and quarter of an inch possible. 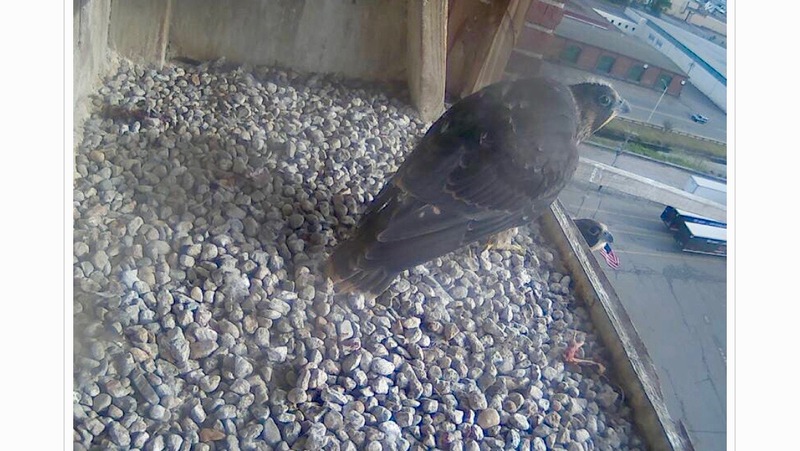 The female was observed inside the nest box just after 7AM this morning, both standing over the first egg and then nestled down lower in incubation mode. She constantly looked around and also vocalized a bit at times. 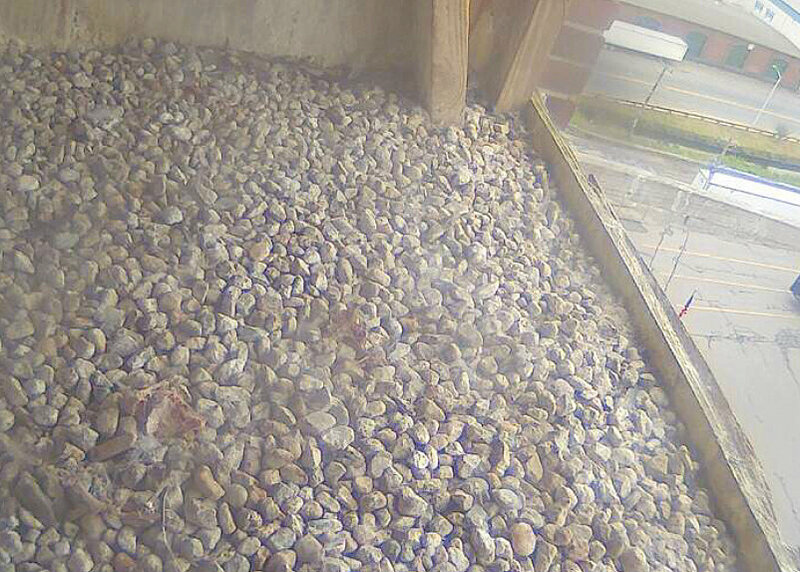 The wind circulated just enough inside the nest box to move her feathers around while she incubated the egg. In prior years, the first egg would be left for longer periods unattended, but this year seems to be getting more active attention. 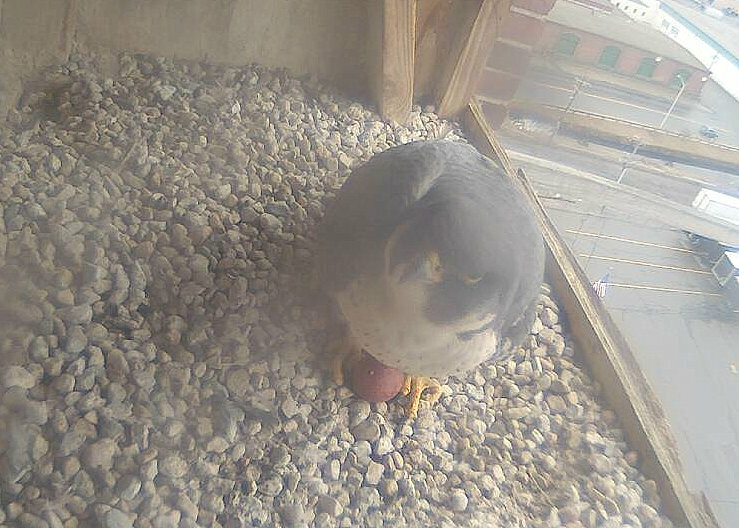 As an observer, you may have to keep watching for a while until she lifts up off the egg and takes a break! 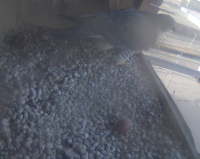 Checked back in later in the afternoon and the second egg had yet to appear and then checked back just before 6PM and the second egg was seen when she lifted up for a few moments and took off for a bathroom break! 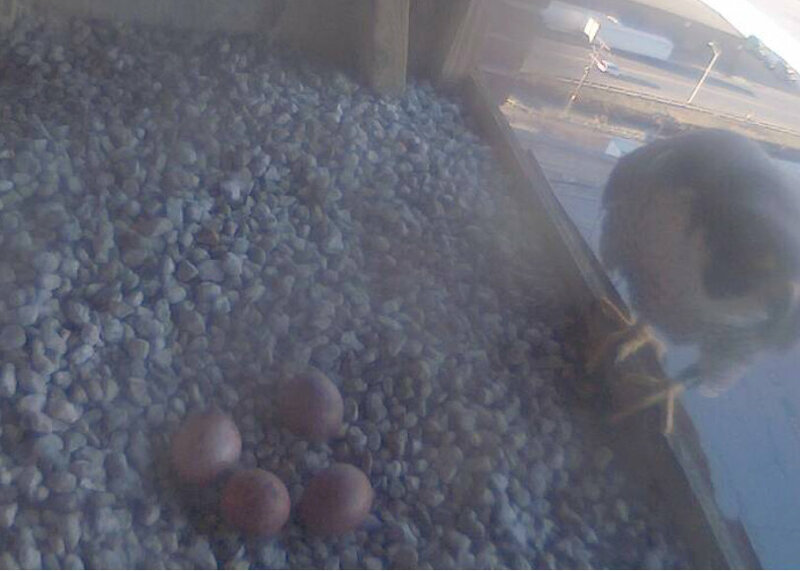 We’ll look for the next egg to be laid, hopefully on Tuesday afternoon!